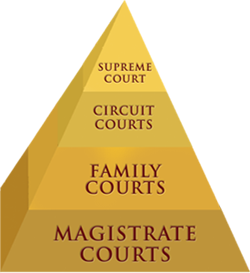 The West Virginia court system is like a pyramid. At the bottom of the pyramid are the magistrate courts, which handle small claims. That is where most court cases are heard. Because magistrates have the most contact with the public, they are known as the "people's court." Next in the pyramid are the family courts, where disputes related to children and families are heard and resolved. There are forty-seven family court judges in twenty-seven circuits. Cases lost in family court can be appealed to circuit courts or to the Supreme Court, depending on the type of case. Next in the pyramid are the trial courts, called circuit courts. There are thirty-one circuit courts in West Virginia with a total of seventy-five circuit judges. Circuit courts are West Virginia's only general jurisdiction trial courts of record. They have jurisdiction over all civil cases totaling more than $300. Civil cases usually involve private property rights, not criminal activity. At the top of the pyramid is the highest court in the state, the Supreme Court of Appeals. If someone loses a criminal or civil case in the circuit court, it can be appealed to the Supreme Court of Appeals. West Virginia has one of the busiest courts in the nation in terms of the number of appeals filed. The Court receives about three thousand appeals each year. West Virginia became a state on June 20, 1863. The present West Virginia Constitution was ratified in 1872. In 1880, the West Virginia Legislature rewrote the entire judicial article, which the voters adopted. The most important event in the history of the West Virginia judiciary occurred on November 5, 1974, when the voters ratified the Judicial Reorganization Amendment, which became effective on January 1, 1976. This amendment ended the justice of the peace system and established a unified court system, uniting all state courts, except municipal courts, into a single system supervised and administered by the Supreme Court of Appeals of West Virginia. The amendment organized the judiciary into three levels: the Supreme Court of Appeals, circuit courts, and magistrate courts. In November 2000, the voters passed a constitutional amendment to allow the Legislature to create separate family courts. The new family courts went into effect on January 1, 2002.